On the 16th (Sat), stop by Your Piece Of Finland, then see exotic creatures in open habitats at a safari tour, then see Santa Claus Office, and finally get in on the family fun at Santa Claus Village. For photos, more things to do, ratings, and tourist information, read our Rovaniemi driving holiday planner . Dubai, United Arab Emirates to Rovaniemi is an approximately 12.5-hour flight. You can also do a combination of flight and bus; or do a combination of flight and train. Due to the time zone difference, you'll gain 2 hours traveling from Dubai to Rovaniemi. Plan for much colder temperatures traveling from Dubai in February, with highs in Rovaniemi at -6°C and lows at -11°C. Wrap up your sightseeing on the 16th (Sat) early enough to travel to Helsinki. On the 17th (Sun), buy something for everyone on your list at Kamppi Shopping Centre, take in the spiritual surroundings of Rock Church, then explore the historical opulence of Sea Fortress Suomenlinna, then take a stroll through Katajanokka, and finally look for gifts at Liopro Finland - Handmade Souvenir. 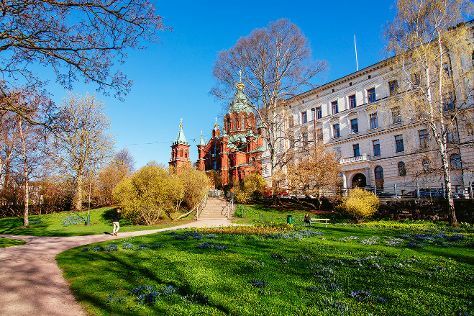 To see photos, ratings, reviews, and other tourist information, refer to the Helsinki trip itinerary maker app . Traveling by flight from Rovaniemi to Helsinki takes 4 hours. Alternatively, you can do a combination of train and flight; or drive. Plan for somewhat warmer temperatures traveling from Rovaniemi in February, with highs in Helsinki at 0°C and lows at -3°C. On the 18th (Mon), you'll have the morning to explore before heading back home.